Every woman would definitely look at him for a second time. He is fair with a gym-trimmed body, well-dressed and soft spoken with unique cosy movements. That’s Mohamed Rizwan, known in Sinhala cine field as Fa. Inhales cinema has constantly been enriched by Tamil and Muslim artists and technicians. The first Sinhala movie Kadavuna Poranduwa was produced by S. M. Nayagam. Sir Chittampalam A. Gardinar, a Jaffna Tamil, who founded Ceylon Theatres Ltd in 1928, produced many Sinhala movies. The first historical Sinhala movie Asokamala and the third Sinhala movie Kapati Arakshakaya (1948) were produced by him. His company owned about 20 theatres and involved in importing and distributing of foreign movies islandwide. Golu Hadawatha, Akkara Paha and Lasanda are few remarkable movies he produced. Contributions made by Jabir A. Kadar, K. Gunaratnam, Lenin Moraes, Rukmani Devi, M. Masthan, R. Muthusamy, Rocksamy, V. Vamadevan, M.A. Gafoor to Sinhala cinema is enormous and remarkable. Sashi Vijendra, a Muslim by birth was a busy actor in the 80s and this unique blend of tradition coming down from 1947 has now given another movie star to enrich the Sri Lankan silver screen - Rizwan Fa. He had acted in two Sinhala movies and believes there are more opportunities around to be bagged. He is very proud to be a star in Veda Beri Tarzan, a Sinhala comedy that ran over 100 days and a success at the box office. “I was the third main character and the exposure was good. I’m very grateful to the producer and director. Tennyson Coray, who did the lead role is not only a great actor but also an understanding and helpful person,” said Rizvan with gratitude. His first movie was Tsunami Ek Kathawak a movie based on the effect of the sea disaster on communities. “I just returned from Middle East and happened to meet Mario Jayasinghe in a social function. He asked me why I am not into acting and it was some thing I never thought of before. A few month after this meeting the tsunami struck Sri Lankan coastal areas. Mario saw for himself the human suffering and decided to share his feelings with the people. He wasted no time preparing ground work for his new move Tsunami Ek Kathawak. That was my first movie. Mario’s team took the camera and went to Hikkaduwa. We finished shooting in three weeks. The movie was released in December 2005, just one year after the tsunami. Though the movie was good, it didn’t do well as expected. But the team was happy that they were able to make a remarkable movie. Riswan is a 28-year-old Colombo boy who has one brother and a sister. He took part in school dramas which he thinks helped to open the doors of the world of entertainment. “I shall always be grateful to Sunday Observer which published my photograph under the model launching contest in 1997” Rizwan pointed out. He spent four years in Dubai working at Duabi Petroleum Corporation where he took great care in trimming his body to shape. He has done modelling, appeared in fashion shows and few TV commercials before taking up acting. “I will not do any job hereafter. Acting is going to be my career,” he said with confidence. He is a good dancer. He has learned Latin American dances such as Samba, Salsa, Jive, Chacha and performed in a few stage shows. He also perfected his talent in acting under the guidance of leading actress Anoja Weerasinghe. “Anoja framed me as an actor. Mario and film producer Sunil T. Fernando also showed me the path,” says Rizwan. He has already been selected to act in Kolampure, sequel to Veda Beri Tarzan which is expected to start its shooting very soon. 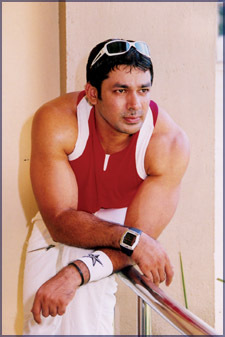 He is also selected to play a major role in Ore Nalil a local Tamil cinema project and in another Tamil movie, Khakki. “I took much interest learning to dance because dancing helps to keep the body in shape as well as to improve the much wanted body language and face expressions. A good dancer can be a good actor. When I went to meet Nilaprian Thawfeek, producer of Khakki, he looked at me for a few seconds and told me that I was the ideal person for the character he has in his mind”. He wanted to be the first actor who could act in Tamil and Sinhala movies. Like every star he too has his dream. He wants to act in a South Indian Tamil movie. Roseanna Jayakody’s award winning cinematic creation, Sankara, approached yet another milestone as it was elected to represent Sri Lanka at the Asia Pacific Screen Awards to be held in Australia on November 13. Around 34 foreign films from 19 countries will be presented at this awards festival. Palitha Perera who was the cameraman for Sankara is among the five nominees for the award for best cameraman. Dawala Doowili, the film directed by Anuruddha Jayasinghe, is all set to compete at one of the most prestigious film festivals in the world - the 38th International Indian Film Festival - to be held in Goa, India, from November 23 to December 3. 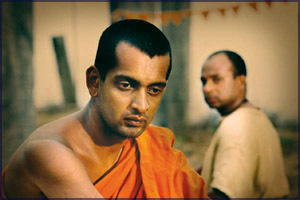 Sri Lankan films had won several awards at this film festival in the past. In 1965 Lester James Peries won the critic award and the Ranamayura award for Gamperiliya while Anoja Weerasinghe clinched the Rajatha Mayura award for best actress in Maldeniyae Simiyon in 1987. Malini Fonseka won a special award for her role in Siripala ha Ranmanika. Sugathapala Senarathyapa was also awarded the Rajatha Mayura award for his short film Minisa Saha Kaputa in 1969. Dawala Doowili is Jayasinghe’s second film. He had previously directed Srankranthiya. Dilhani Ekanayake, Mahendra Perera, Grace Ariyawimal and Sandali Walikanna lead the cast for Dawala Doowili. The music is by Nawaratne Gamage and camera direction is by Ruwan Costa. Script and production is by Professor Nimal Senanayeke. An essay competition for school children based on the cinema industry will be held by the National Film Corporation. * All the essays should contain no more than 1,500 words. * Should be written in clear hand writing or typed on one side of A4 sheets. A one and half inch space should be kept from the left hand side of the sheet while the other three sides should have a one inch space free. * The participant should include a written document assuring that the essay is his or her own creation and had not been presented for another competition or had not been in print before. * The application containing full name, age, personal address and school should be certified by the principal/head of the institution of higher studies. * All the essays should be addressed and sent to “Manager, Cinematic Cultural Bureau, National Film Corporation, N0 303, Bauddhaloka Mawatha, Colombo 7 before December 31.